Narayan Khandekar, Harvard’s head art conservation scientist, thought he had seen, analyzed, and repaired just about everything, from ancient broken pottery to faded Impressionist masterpieces to indigenous Australian bark paintings to human hair woven into modernist works. Then came a fresh challenge. The Harvard Art Museums acquired the evocative “A Flor de Piel,” a room-size tapestry by contemporary Colombian artist Doris Salcedo, consisting of thousands of dyed rose petals stitched together to form a burial shroud. Khandekar’s frank admission doesn’t mean he and the museums’ staff aren’t ready to care for and conserve the delicate creation. In fact, Harvard’s well-respected conservation lab and staff of experts is a main reason the work’s new home is in Cambridge, said Mary Schneider Enriquez, the Houghton Associate Curator of Modern and Contemporary Art and the driving force behind the acquisition of the 11-by-17-foot work. Harvard’s rich conservation history dates back almost a century to one man’s fascination with using science to understand and study great artworks. Hailed as the father of art conservation in the United States, Edward Forbes, who was director of the Fogg Art Museum, founded the Department of Technical Research (later named the Straus Center) in 1928. Today, the center staff uses knowledge from the past along with the latest technology to restore, repair, and safeguard works for future generations. To ensure that her piece would stand the test of time, Salcedo also relied on modern science to stabilize “A Flor de Piel,” and she provided Khandekar and his Harvard team with explicit storage and upkeep instructions. Anyone who has tried to dry flowers knows that petals harden and crumble. Determined to preserve her petals in a suspended, supple state, Salcedo sought the help of scientists in Bogotá, where she and her team treated the flowers in her studio with a suite of chemicals, including turpentine, glycerin, and collagen, and flattened them between sheets of foam. When sewing the petals together they used waxed thread that allowed the fiber to pass through the petals without ripping them. Finally, they stitched the petals onto a thin sheet of biofilm, a flexible polymer that lends the work an extra layer of stability. The piece is stored on a roller that features adjustable tension. 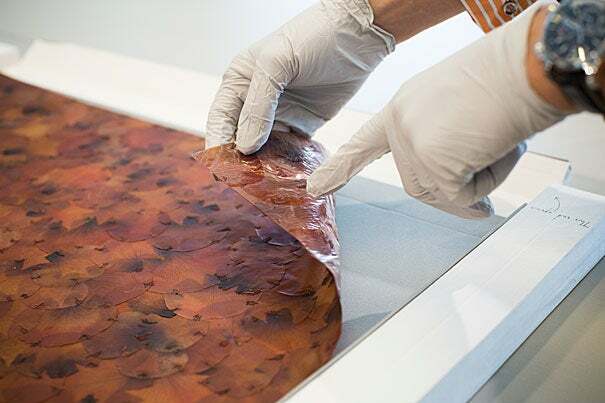 It is protected on either side by several polymer sheets, and conservators carefully wind the work onto the device when preparing it for storage to avoid creating wrinkles that could expose its fragile surface to oxygen. “We are trying to be forward-thinking. Prevention is really the best thing,” said Khandekar. The concept of time is pivotal to Salcedo, who is considered one of the world’s most influential living contemporary artists. Making viewers pause to reflect on and honor life’s fragility and what has been lost by those who have been devastated by political and civil violence is the animating impulse behind her sculptures and installations. Recently, distraught by the Colombian government’s failure to reach a peace accord with the Revolutionary Armed Forces of Colombia, or FARC, Salcedo filled a public square in the capital with 7,000 meters of white fabric that had been covered with the names of those who were killed and went missing during the nation’s 52-year civil war. Like much of her work, “A Flor de Piel” is a subtle study in both beauty and horror. Instead of choosing graphic images or incorporating vivid words such as sadness, death, or murder, Salcedo uses her artistry, her painstaking attention to detail, and her choice of medium to draw viewers into the piece’s deeper meaning, said Enriquez. “A Flor de Piel” was inspired by the story of a Colombian nurse who was kidnapped and tortured to death after aiding those injured on both sides in the civil war. In that vein, the work represents a floral offering to the deceased. The evocative materials carry the emotional weight of the piece, said Enriquez. The white rose petals, dyed red, are redolent of dried blood, and the supporting armature enables the textile to fall in folds resembling a giant ruffled bedsheet. “Doris Salcedo: The Materiality of Mourning” will be on view from Nov. 4 through April 9, 2017, and will feature four installations, including a number of Salcedo’s works created between 2001 and now. An opening celebration on Nov. 2 at 6 p.m. will feature a discussion with Salcedo, Elaine Scarry, the Walter M. Cabot Professor of Aesthetics and General Theory of Value at Harvard, and Mary Schneider Enriquez, the exhibition’s curator and the museums’ Houghton Associate Curator of Modern and Contemporary Art. 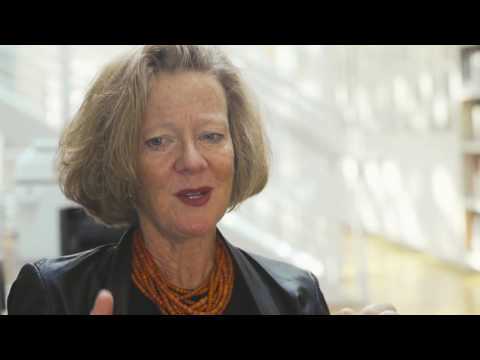 Mary Schneider Enriquez, the Houghton Associate Curator of Modern and Contemporary Art at the Harvard Art Museums, discusses the upcoming special exhibition Doris Salcedo: The Materiality of Mourning (November 4, 2016–April 9, 2017).